All those red dots suggest hazards are ahead: if layoffs accelerate in the auto sector, as they appear likely to, and no other manufacturing industries pick up the slack, scores of Midwestern and southern metropolitan areas and small towns—especially along Interstate 65 from the Great Lakes to Alabama—may have to deal with reduced help from what has been a steady source of decent employment, taxable sales, and economic momentum since the crisis. Such layoffs would be a disappointing headwind as more metropolitan areas in the industrial Midwest, for example, continue to reduce their unemployment rates—including via the interesting ways tracked by my colleagues Alan Berube and Cecile Murray. The category of light trucks also includes SUVs. Who doesn’t have one that wants one and can afford one? Bloomberg says Used-Car ‘Time Bomb’ Expected to Drag on U.S. Auto Sales. It’s going to be tough to beat last year’s record U.S. sales of 17.55 million cars and trucks, according to a new study released Wednesday by AlixPartners. 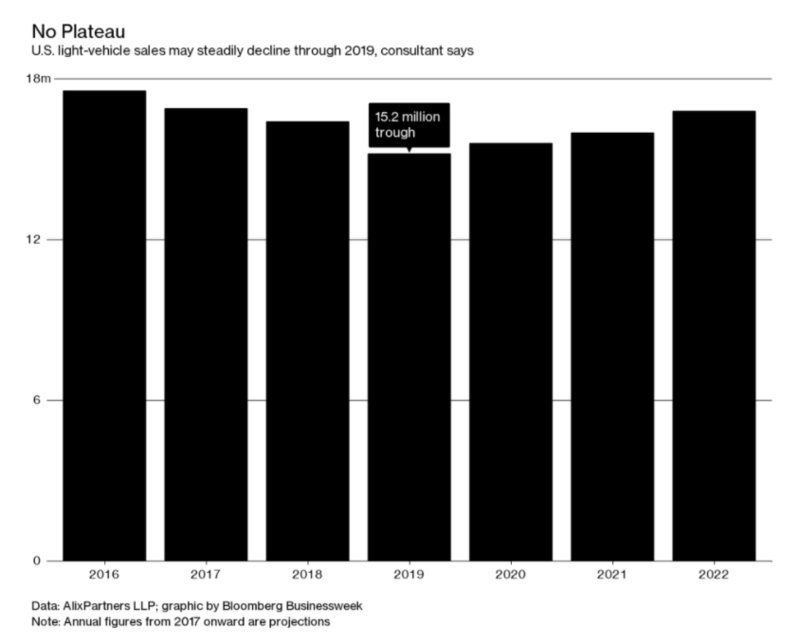 The consultancy expects a total of more than 1 million vehicles to come off lease last year and this year, creating a “used-car time bomb” that drags on demand for new autos. For the last 11 months, discounts on new vehicles have averaged more than 10 percent off the sticker price, a historical harbinger of automotive downturns, AlixPartners said. Huge disruptive changes towards self-driving vehicles are on the way. Those changes will not be here by 2019. Many of my readers doubt Ford’s announced 2020 date. Presume Ford’s date happens. How many people want to buy a first generation self-driving vehicle? Presume Ford’s 2020 does not happen. How many people will wait until it does? Presume either way, how much more will these vehicles cost compared to used cars without self-driving features? Will the attitudes of millennials towards debt change in the next five years? Will the attitudes of millennials towards possessions like cars change in the next five years? Will the attitudes of millennials towards family formation (providing a need for larger cars) change in the next five years? Who is buying all these SUVs now? The answer is not millennials. Retiring boomers is one possible answer to question 7. Is it their last car perhaps? Here’s a bonus question: Will Trump put in place steel tariffs further increasing costs of new cars? Attitudes may change on a dime. So I do not have guaranteed answers to any of those questions. Yet, many of the trends are clear and I expect them to hold. The manufacturing picture I present is not pretty: Manufacturing has peaked for this economic cycle. no matter the subject or outlet, Trump is in there somewhere. the media companies know a cash cow when they see one. IS manufacturing McDonalds making burgers or a company assembling Chinese components? How many people want to buy a first generation self-driving vehicle? The early adopters will be paying a fairly steep price. I suspect most sales will be fleet sales to Uber, Lyft, and taxi companies who can recover the costs. Though I personally look forward to self-driving, I am not an early adopter for most technology. I wait for prices to come down. How much more will these vehicles cost compared to used cars without self-driving features? This difference will be substantial. Not something the typical consumer can afford at first. I definitely think the future is self driving. I just think it will take longer than you expect. great thought experiment – when we discuss adoption rates, we should be careful to distinguish between level 4 & 5. Level 4 is already in extensive beta testing. It’s real and works. Retail sales 2020 for certain. Future US will have 20-30 million level 4 vehicles on road by 2026.
level 5 is a different story. beta testing has just barely begun. adoption will follow level 4 by 4-5 years. Not me. I’m holding out for teleportation. An the Chinese put a photon into orbit man, next its gonna be a rat, an then its the quantem raffle and that could be you dude! One mo your sittin in your pool waitin for a truckload of coal to arrive, and then befo you can say ” 5 and 5 makes more than 9 an less than 11 an it aint 10.5 or 9.5 neither” your face ta face with a sola panel at 1000 miles with the good ole US of A sat below sayin ” Son, ya really screwed up this time “. They just got no confidence in China an tech an trekky stuff man, but they gonna learn the easy way whos right an whos wrong. I don’t trust Quantum Mechanics since I discovered that Heisenberg was cooking meth. If it isn’t pure and authorised self driving, might it be classed as a distraction, or encouragement to not keep full control of the vehicle? I’m one of those boomers hoping to retire. Some day. Visited family in Detroit area last week. GM, Ford, Edmonds, and one other represented. Even they can’t stomach a $60K+ pick ’em up truck price, even with a fairly new trade-in; Leases are the game. for now. incomes on Zillow or your favorite site. Compares quite favorably to the Seattle region, especially factoring in housing prices. Disposable income is an important metric, and qualitfy of life outside core Detroit and the other troubled mid-west cities is quite good. Automation Alley in the Farmington Hills, Ann Arbor and Dearborn areas are doing quite nicely. I work for a software company who provides software for dealer, service operations and marketing, not in the Detroit area. Some of our marketeers seem to think that milennials are a ripe target market. As parent of a few milennials, I think they’re a little optimistic, or preaching to the consulting and Wall St choir, looking for their next jobs. Also just bought another “last car” – like you I’ve got a personal fleet, and with a plethora of young boy drivers I’m sure I’m sending my insurance broker on Swiss skiing trips every year. C’est la vie. I’m determined this is the last car I’ll ever buy. But hen, I’ve said that twice in the last 10 years even though I’m on board with Mish’s self-driving car predictions. So you have something in common with Elton John. Calls his partner ‘hen’ too. I knew what he meant.. and yes. “warped” is a good way of describing it. I meant my young (driving age) sons – let me just be clear on this. I was funning, I think worldy was too (but he has such a warped sense of humour it concerns me sometimes). I try to proof read but never reach 100%. Mostly I am on a phablet and it can be a bit nerve-wracking at times… you lose long comments if a page refreshes, sometimes the page jumps or writing hangs, there are several way to click out of the page too, but the worst is when I write in something nonsense or too personal ( about self usually) and you realise you don’t want it sent.. times I litterally tried to stop the signal after pushing ‘post’. Even now I often delete the autofill fields so the comment doesn’t send without meaning to. I imagine others aren’t always too bothered about all that, but sure I pick up on people getting in panic every now and again. It is really all about change. No matter how good you are if you are not taking notice outside you will be hit on your blindside. Like how Nokia got hit so bad that it never managed to recover. I made the mistake of adopting Ford’s Hybrid Escapes when they first came out. Had a world of problems that several dealers couldn’t fix and that ultimately Ford would not stand behind either. Made the switch back to Honda and the traditional ICE and have never been happier. I would not be an early adopter. There will be lots of issues both hardware and software and would not trust my life to a manufacturer that source out critical parts to the lowest bidder. Don’t doubt a slow down is coming. Cars and fuel efficiency will come back into the vogue when gas prices go north (some day) over $3.50/gal. …whilst many other readers just plain doubt Ford. Looks like you are on target Mish, but what are the key stats that you are monitoring that would prove you wrong? Switch to self driving? Really?? Who is going to pony up that kind of money (ie: $1M+/car) when the population can barely even afford vehicles at a fraction of the price? Mark, you’ve mentioned that $1M several times here. Where does it come from? Tesla are saying their sub $50K car will come with all the sensors and controls to run in self driving mode when the s/w is ready to upload. If this was distributed at $10K per car, you’d need to sell 50,000 units to get your research investment back. I can think of a lot of people with an extra $25K ($15K for sensors, $10K for s/w) who would want the bragging rights to having the first self driving car on the street. the state map was intereting i nthat jobs decliend n teh Chicag area, and it looks like jobs improved in the Kenosha/Racine area alon I-94, which happens to have a relatively new Amazon whse, U-line and an office/Whse of Medline, the latter two I think are big family owned companiesin NE Illinois. The Fed gave 4.5 billion dollars for the development of electrics/self driving vehicles infrastructure last year. Apparently they want it bad in a hurry, so we the public, will get it bad. If the market was left to determine the schedule, we’d be much better off. Graphine lithium ion battery technology looks much more promising than present tech, but it’s years off in the future. Meanwhile, we can expect several delays to the government’s schedule mucking through all the unforeseen problems. things turn out much better when the technology is well developed rather than forced through the pipe through finance, but try and tell gubberment that. I suspect that it is an attempt to take the lead in an industry that will be worldwide. But I think that auto companies will be amortizing those start-up costs over a long period of time rather than selling at much higher prices. And we appear to be nearing the end of an artificially-generated economic bubble to boot. The gubberment tries to lead everything down a road it would not travel in a free market. Try this one on for size: There is an energy group and I can’t remember which one, but they want to install solar panel farms in Huron County, Michigan, probably as part of the left over ‘Bama clean energy push that has nearly doubled the average electric bill. Now if you check the area, it’s spring, winter, and fall seasons see only occasional sunshine. On its face it’s a rediculous proposal, somehow this thing is getting a big push, regardless. You can bet thete is somebody that has a friend in a place of power. Huron County already has a large number of windmills in operation to fulfill the green energy requirement in the state and now any additional windmills have the residents up in arms. They have had enough and are shunning the residents that are leasing there land for green energy of any kind. Around here (Jersey Shore) every building tradesman (plumbers etc) has a shiny new hi-roof work van. I used to select plumbers etc based on who had the oldest trucks, I didn’t want to be paying for their overhead and generally they were the hungriest, the most reasonable pricing. Now I don’t know who to call, they’re all brand spanking new! Realtors are calling unsolicited, “are you interested in selling, do you know anyone who might be, we had 12 offers on a house in 3 days”. Automobile sales for June here in Houston were down 25.9 percent. Year-to-date Houston auto sales are down 16.8 percent, and this is coming off a collapse in sales last year. We’re back to 2009 numbers in terms of auto sales. Cars today last longer than the ones built in the 1970’s and 1980’s. There’s less need to replace them as quickly. And the auto-industry relies too heavily on leases and sub-prime financing suggesting their customers cannot afford their product. And in my own case, seeing that virtually every new car is a four cylinder turbo I am extremely disinclined to trade in my perfectly working 12 year old BMW with its smooth and powerful in-line six cylinder engine. This is a key point. I’ve got a ’97 Camry that is still running great and only has 150K on the odometer. Why sell it just to buy a replacement new car? Note: My new Honda Fit (2013) has cost me $1.20/mile since I bought it (including depreciation), and $0.36/mile in 2016. My Camry has cost $0.45/mile since 1997 and is cost $0.33/mile in 2016. Yes, I am that detailed oriented, and yes, it does drive my wife nuts. In Japan, they make it impossible to own a used car unless it’s a historic car. The taxes and inspections are just too much to bear. This allows Japanese automakers in Japan to do well, and has created a great business for used car exporters. Many Japanese used cars end up all over the world because they’re in such great condition, and Japanese take very good care of their things. We might have to adopt such methods if it gets too bad. Which countries drive on the right side? I’ll start to plan my side business now…. There is also the hidden technology that people did adopt, that pays for itself by a lot: Rust prevention. Every new car gets it. As a result, cars last much longer than they did, once upon a time, and the need for new cars drops in proportion. Predicting the future is tough. Getting the timeline correct is almost impossible. In 1999 the prevailing theme was that all brick and mortar stores would soon close and all shopping would be online in a few years. Today we see that after 18 years, online sales are finally starting to have an impact on brick and mortar. And the prevailing wisdom now is that online might capture 25% of all retail within the next 10 years (not 100%). 1. People and companies do what is in their best interest from a cost/benefit analysis. If it doesn’t make economic sense to spend 40K-80K on an all-electric vehicle then you won’t. Though you might spend 25K on that simple hybrid. The first self-driving vehicles will simply be too expensive to make economic sense for all but a few. I don’t think they will cost 1 million (as Mark says), but I suspect level 5 will be in the 100K area at first. They will have to drop in price (and they will) to the 30K area to approach mass adoption. 2. Regulation. Governments work at a glacial pace, especially when all levels have to work together (federal, state, local). Since self-driving requires government to set up the rules and regulations, I expect significant delays in reaching mass adoption. 3. Infrastructure. As many have mentioned, there are many areas where infrastructure may need improvements to have self-driving work everywhere. There will be a lot of delays that result from arguing over who gets to pay for this. I wish that self-driving could happen faster because there will continue to be hundreds of thousands of road deaths and millions of injuries in the meantime. But sometime, you just have to let things develop at a realistic pace. 100% = never. Just meet my wife. She has never ordered anything online. For her, and I assume many women, it is all about going out on the hunt. In 1999, no one thought all brick and mortar stores would close. Amazon only sold books. We were way off from anyone thinking stores would all shut down. You’re at least a decade off in your timing. I remember talk of it in the very late ’90’s, back when I was having 40 pound bags of Eukenuba dog food delivered to my house (with free shipping) from pets.com for $6. Pets.com lasted what? A year. So whoever thought they would take over b&m was way off. The point was that people did think it. I suspect that China will become a world leader in self-driving as they won’t have to worry about fighting over rules, regulations, and infrastructure. Will you need a drivers license for a self driving car? If not, I can see a huge potential demand. People who don’t have a drivers license. Many old people can’t get them. Kids under the legal driving age will use them. Having the car drive my kids around while I stay home is a huge incentive. A lot of people just don’t like to drive or are terrible drivers. Not to stereotype, but many Asian women fall into that category. What about people who have DWIs? Insurance costs may make getting a self driving vehicle a wise choice. 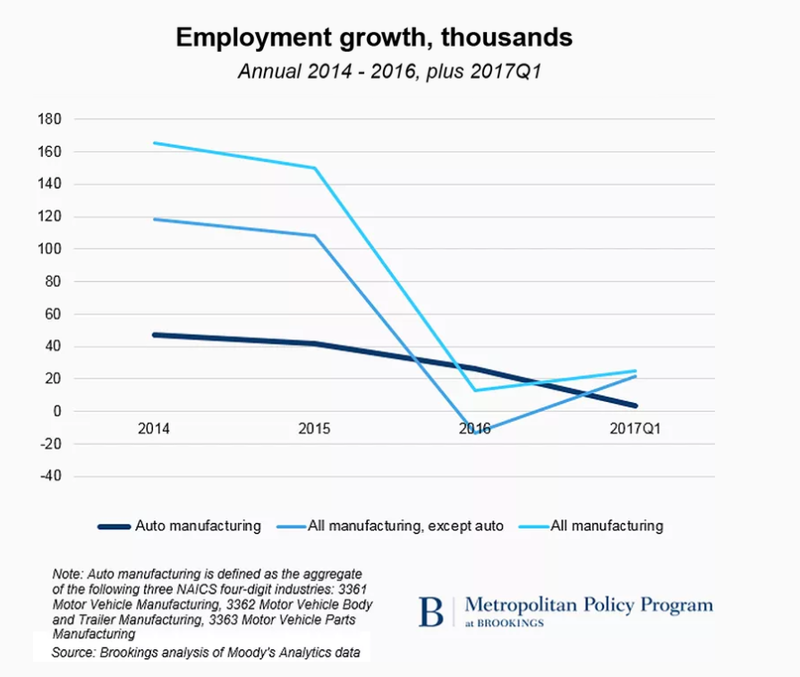 The welfare brats at Brookings Institution are going to blame Trump for the auto slowdown? Trump might be egotistical, and he might be a politician (liar) — but this stupidity needs to stop. I think Brookings Institute, and the downright moronic policies they have lobbied for under multiple presidents, deserves far more blame for the auto slowdown than any single president. Blame Trump for his own failings, but blame the Washington DC insiders club (media and lobbying groups like Brookings) for their failings. Decades of bad government policies — from union support to military subsidies to misapplied “safety” regulations to EPA enviro-terrorism to boneheaded lending programs — are to blame for the auto slow down. No one ever repealed the business cycle. I don’t see anything in the Brookings article that blames Trump. Brookings is talking about a cyclical decline, affecting the economy, which in turn affects the President in office at the time. The very title of the Brookings propoganda piece mentions “Trump” along with auto slowdown. Its stupid. Trump has absolutely nothing to do with it. Washington DC can’t make the auto industry better. Its absolutely stupid for the tax evaders at Brookings to even imply, much less explicitly state, that any President (or Congress) can fix private industry. Politics can crush industries with taxes or boneheaded regulations. They can shift purchases forward or back a few years with tax incentives or unfunded rebates (cash for clunkers being a giant boondoggle example). Clearly the PhDs avoiding taxes at Brookings don’t have a clue. Washington DC doesn’t run the economy, they just tax it. The whole country needs to stop pretending that Washington DC can fix healthcare or the auto industry or anything else. It does not work, and we have decades of PROOF under both political parties. They can’t fix it. Brookings entire business model is based on soliciting tax exempt donations to bribe politicians to meddle in things that politicians are not capable of fixing (even if we could find more competent people to run for office, they wouldn’t be able to fix industry either). 3) Given the mess that is Washington DC, you should be comparing the cost of having steel workers (at iron refineries, at coal mines and other supporting industries, etc) versus the cost of having these citizens unemployed or underemployed. When you add up welfare costs, education costs (especially the disastrous schools in big steel / coal communities), healthcare for unemployed / children… millions of people just sitting around getting obese, watching bad TV, taking drugs, and getting into trouble (crime or birthing latchkey kids). The cost of not having a tariff is enormous. Its very idealistic to say tariffs are a yes/no question. A more practical answer would include the full costs of all the options and trade-offs. If you are going to be anti-tariff (which I agree with in principal, but its not practical) — you need to be honest and say those benefits come at a huge social cost. Having millions of people sitting around doing nothing, raising children who never see their parents work / always see the welfare check coming instead… how does that “save money” for taxpayers? Getting rid of tariffs without addressing the social costs is just being dishonest. Lopsided trade agreements designed to help libtards purge the white male guilt that they invented is terrible economic policy and terrible social policy. And like it or not, socialists like Obama tangled trade policy with social welfare spending. Please be practical and recognize the full costs of “free trade” (as Washington DC mis-defines it). I often don’t like Trumps tactics, but he is forcing the country to recognize some of the implicit trade-offs we have been making. And at least according to Trump’s way of thinking, the end result matters more than how he gets there (he will p!ss you off and offend you in the near term, so long as the long term result is what he wants). Real estate developers don’t think the same way as politicians. If you make something yourself, you “own” it. If it “belongs” to someone else, you have to exchange something for it, i.e. pay in some way. So you have a group of people and they make autos for themselves from scratch. All they contribute is their time as the other resources are at hand. They end up with autos and all else roughly equal. And it does, except you have put in their hands to buy something of yours in exchange. That is good too, after all trade will ensure worthy allocation of resources, except this “outsider” who works for less now has market access, he has the wages a local person did not earn, and he will buy what a local might have… a property for example, or shares in a company. The company gets valued higher, property owners benefit from the competition, but the previous worker finds himself crowded out. Making autos was his pastime, an extra in the all, as his society existed before them, but now the outflow of cash to outsiders returns to make his traditional everyday existence outside of autos impossible, sidelined from the new economy by rising prices. That is the nature of competition, progress, but you should not wonder why some people believe they have a valid claim over a market, as they themselves created that market, and the society which used that market could only exist because of it. How much are you willing to trade, and what for? You should have a pretty clear idea of that before searching for fast profit, else why not just sell off the entire country and have done with it? @chrysangle — I think we are saying the same thing. In principal, in a “perfect world”, free trade (both directions) is clearly the best solution. But because of Washington DC’s meddling, that is not the question at all. Maybe it should be, but it isn’t. And one has to be practical. Is it cheaper to buy a $25K car, and then spend $15K/year for seven years on social costs (charged in taxes)? Or is it cheaper to have steel (and other) tariffs, pay $40K for a car, and have $5K per year for seven years in social costs (taxes)? Total ownership costs are (in this hypothetical example) $105K for the tariff free setup, versus $75K for the tariff setup. I doubt a real world cost comparison would be as straight forward, but the point remains: getting rid of tariffs is a great idea in principal (and I agree with our blog host). But in practical terms, its not so easy. Welfare teaches people (and generations of children after) to be obese, watch TV, make more latchkey kids, and commit crimes. That is not saving money at all. Whether tariffs are the best way to solve this problem, I don’t know — but its pound foolish penny-wise to complain about tariffs while destroying domestic jobs. There is a trade off. I think Trump is already making things worse because of his desire to be unpredictable. Businesses don’t like to invest when there is uncertainty. That’s one reason I lowered my US growth expectations from 1-2% to 1%. Compare how big government spending (federal + state + local) is, as a percent of GDP, versus where the same ratio was 40, 80 or 120 years ago (roughly one person’s working career — make the intervals a little longer/shorter if you like). When industry grew, there was wealth to spread around to the middle class. When government grew, everything became about taxes and lobbying and finance schemes. When Detroit and NYC and Pittsburgh and Houston were big weatlh centers, the country thrived. Today, wealth is in Washington DC — the zip codes with the highest median incomes are all bedroom communities in VA and Maryland (around Washington DC). Even the so-called silicon valley software GSEs (Google, Amazon, Faceplant, Oracle, etc) are just government funded messes. Government contracts. 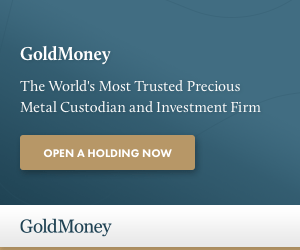 money losing operations that rely on continuous share sales to fund losses (implicitly underwritten by Fed “free” money). “Once a principle is established as orthodox, its observance is enforced in much the same way that a religious doctrine maintains its integrity: by repressing or simply eschewing heresies. “Deducing laws from premises deemed eternal and beyond question is a time-honoured method. For thousands of years, monks in medieval monasteries built a vast corpus of scholarship doing just that, using a method perfected by Thomas Aquinas known as scholasticism. However, this is not the method used by scientists, who tend to require assumptions to be tested empirically before a theory can be built out of them. “But, economists will maintain, this is precisely what they themselves do – what sets them apart from the monks is that they must still test their hypotheses against the evidence. Well, yes, but this statement is actually more problematic than many mainstream economists may realise. Physicists resolve their debates by looking at the data, upon which they by and large agree. The data used by economists, however, is much more disputed. When, for example, Robert Lucas insisted that Eugene Fama’s efficient-markets hypothesis – which maintains that since a free market collates all available information to traders, the prices it yields can never be wrong – held true despite “a flood of criticism”, he did so with as much conviction and supporting evidence as his fellow economist Robert Shiller had mustered in rejecting the hypothesis. When the Swedish central bank had to decide who would win the 2013 Nobel prize in economics, it was torn between Shiller’s claim that markets frequently got the price wrong and Fama’s insistence that markets always got the price right. Thus it opted to split the difference and gave both men the medal – a bit of Solomonic wisdom that would have elicited howls of laughter had it been a science prize. In economic theory, very often, you believe what you want to believe – and as with any act of faith, your choice of heads or tails will as likely reflect sentimental predisposition as scientific assessment. “The mystery is how a conception that is vulnerable to such obvious counterexamples survived for so long. I can explain it only by a weakness of the scholarly mind that I have often observed in myself. I call it theory-induced blindness: Once you have accepted a theory, it is extraordinarily difficult to notice its flaws. As the psychologist Daniel Gilbert has observed, disbelieving is hard work.” – Daniel Kahneman who shared the 2002 Nobel Memorial Prize in Economic Sciences with Vernon L. Smith. Why I think timetable might be delayed a bit … are the Big 3 going to invest $billions during a recession? Current so called recovery (in the 97th month) is the third longest … EVER. Automakers don’t have billions to invest … in anything. They are bankrupt, and only exist because of taxpayer bailouts. Even financed at 0%, the R&D needed to make electric cars work is deficit spending. The underlying car business (as currently configured) makes zero sense, no matter where the car’s energy comes from. Cute how Brookings Institute and Bloomberg fail to mention #1 reason for pull back. Credit … or lack of it. Rising delinquency rate will do that. “Lenders and finance companies have dramatically pulled back the number of loans they issue to borrowers with the poorest credit records. A new report by Experian shows the number of loans written in the first quarter for borrowers with subprime and deep subprime credit ratings fell to a 10-year low. Collectively, auto-loan originations in those two categories dropped 8.6 percent in the first quarter. If a sizable portion of one’s customer base cannot afford to buy one’s product without external subsidies, then its not a viable business. Either the cars cost too much, or customer incomes are too low. Period. Providing external subsidies (cheap loans) to goose the results is just robbing the future to pay for the present — a tactic that only works short term. PS — several people complained about my using the “royal you” in comments, so I shifted to saying “one’s customer base” instead of “your customer base”. Not sure which phrasing is better — “you” can appear a little aggressive, “one” sounds like an academic tactic to censor thought with political correctness. Was just saying was all, as one does if one wishes to politely mention . You could use ‘Ye’ or ‘Thou’ 🙂 ? Or in this case ‘a’ ? EV’s are just beginning to come on line (Tesla Model 3, etc.). When you check with NADA in 2020 as to the value of your ICE vehicle, it will be priced as “Salvage”. EV are priced less than salvage, because disposing the battery is an environmental liability. My uncle bought a Toyota Tacoma and drove it 27 years. He sold it, bought another Tacoma and has had it 15 years. I bought my Tacoma 10 years ago and it is still running strong with no rust. My uncle had minimal repairs on both vehicles. Mine is the same. Runs like a watch. This is hopefully my last vehicle. Also my millennial son got a 95 Tacoma in high school. Drove it 5 years with no problems. He traded it in for a 2003 Tacoma he still drives with no problems. I asked him if he was going to buy a new car since he could afford it now. He said why bother it runs great. So much for the millennial market. They are frugal and prefer used to new. Americans used to fix things, back when we had a functioning private sector. Recent generations (boomers?) got into that habit of throwing everything away and buying new cr@p on credit. All that did was clog landfills, create debt that never got paid, and shift jobs overseas. How many baby boomers would have a mechanic gut their truck — replace the engine, transmission and differentials — instead of just buying new junk? How many consumers are aware that rebuilding your existing car’s power plant (engine, transmission, differentials) is often much cheaper than buying a new vehicle? I’m hoping to keep my 14-year-old, 215K mile Corolla going long enough to switch over to an electric autonomous vehicle. Honestly, I totally regret buying my 2016 BMW X3 back in 2015 (a 2016 model). It has lost over $10k in value while I’ve only driven 23k miles. Shoulda lease it instead.
. After people have settled close to them, they made people be addicted to them even more.